I take my lunch every day to work, while also carrying my handbag. I don't really want to carry a tote to hold everything because I find that kind of heavy and cumbersome. 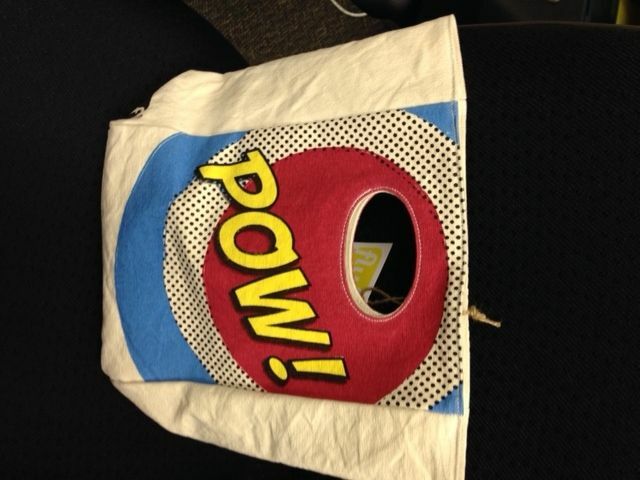 Yesterday in the hospital gift shop of all places, I found this adorable lunch bag. It kind of reminds me of that Phillip Lim for Target line with the Boom sweatshirt (shout out to MaryK!). When I saw the famous Vince Camuto tube skirt show up in my local store in a new marble pattern, I knew I had to pick it up. These skirts are fantastic for the office and weekends alike, and can be dressed up or down. And the comfort factor is beyond fabulous. This particular midi did not come in petite in my store so I did purchase the regular and decided I really like the longer length so don't think I'm going to shorten it. 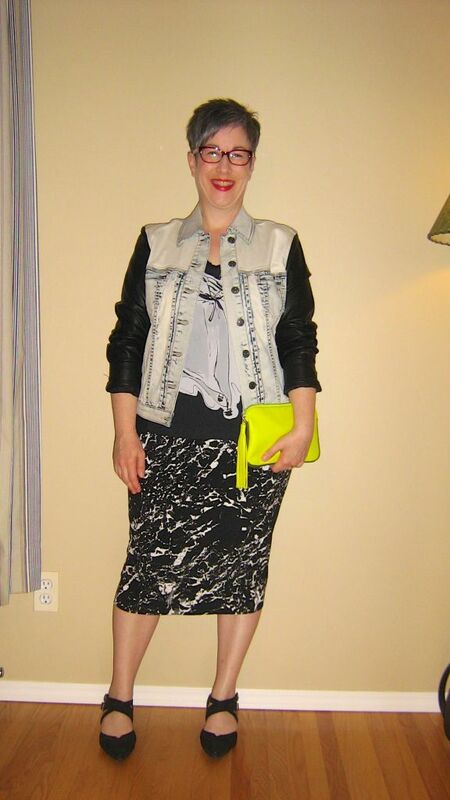 I paired the skirt with my graphic black and white ballerina drapey tee and then topped that with my faded denim jacket with leather sleeves, scrunched of course. For footwear I went with my black pointy toe sandal shoes and chose my citron clutch for a pop of unexpected colour. Red specs and red lippie round out the outfit. This is definitely on the casual side for work but on days where we don't have meetings and there are no "big wigs" coming into the office, this is more than acceptable. This would also work great for a weekend MOTG outfit. So what do you think? Does this all work together? Should I shorten the skirt or leave as is? As always, all comments/suggestions welcome. I feel like there's a hint of Duran Duran and Miami Vice in this suit and you know what? I LOVE IT!!! 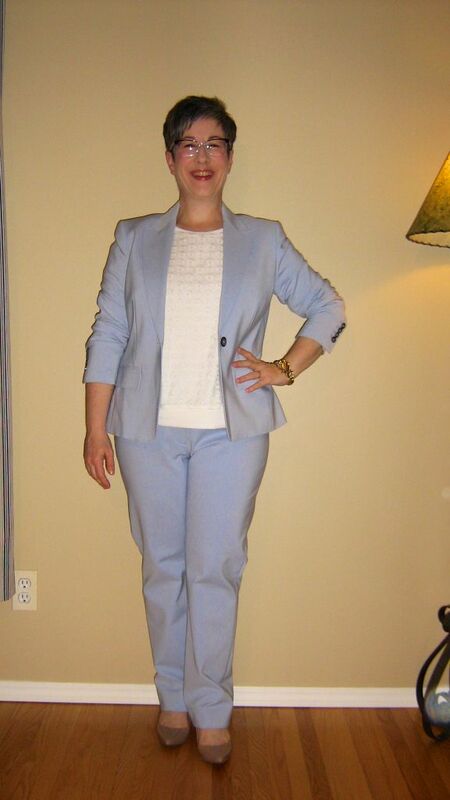 Today is the first wearing of my pastel blue suit. I paired the trousers with my cream lace front drapey tee and topped that with the matching suit jacket, with scrunched sleeves. For footwear, I went with my taupe pointy toe kitten heels and chose my quilted cobalt/cream/black handbag. Jewelry is my gold wedding band and a vintage gold bracelet. i went with my purple/clear specs and soft pink lip colour to finish off the outfit. Once again, I think my wall colour is slightly skewing the colour of my suit - it is a true pastel/baby blue. So what do you think? Wildcard good? As always, all comments/suggestions welcome. Yes…SNOW…we got three new inches last night and now it's sort of half raining-half snowing outside. I had planned on wearing my new pastel blue suit for the first time today but there's no way I'm going to wear pale blue trousers in the slush when they're dry clean only. So I had to come up with a Plan B and thought of Angie's olive and pink ensemble. 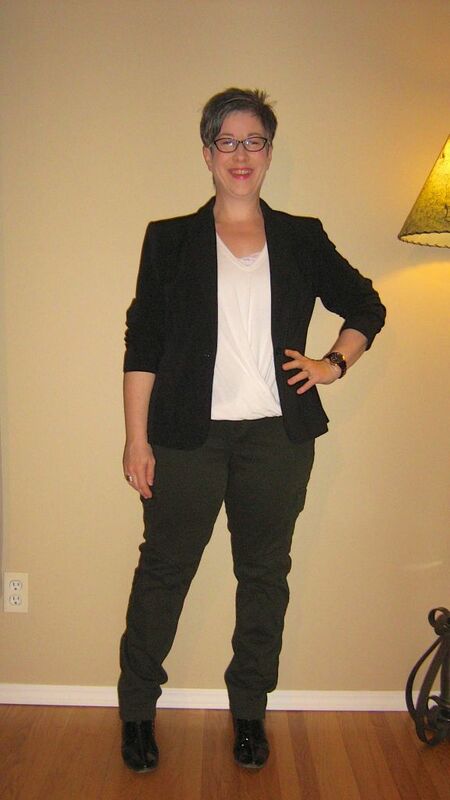 I pulled out my olive cargo pants (which have already proven themselves to be a wardrobe workhorse). I don't have a pink top to wear with the trousers (I have now identified this is a wardrobe hole) so went with my olive/grey/white camo-esque mixed media pull over. I had originally semi tucked it but decided I like this top untucked so you can see the entire front. I then added my taupe kitten heels (although it will be boots outside until I get into the office). And on top of it all, have added my blush pink leather moto. I really quite liked the soft pink over the camo top and cargo pants. But I got stuck on the handbag - I don't have a taupe or camel bag to tie in with the shoes so ended up going with my large cream handbag to pull out the white in the top. I don't think it works though but no time to change it now. Today's outfit started with my bone laser cut oxfords - I've been looking forward to it being warm enough to wear these shoes. This will be their 3rd spring/summer and I'm still loving them. Do you ever start your outfit with your footwear? I've paired the oxfords with my white jeans and then added my brilliant cobalt blue (with subtle black print) pleated and drapey tank. Over top of that, I've popped on my white leather jacket. I went with my yellow/cobalt clutch (the zipper matches the colour of my top), red specs, silver Haida wedding band and subtle pink lip for accessories. 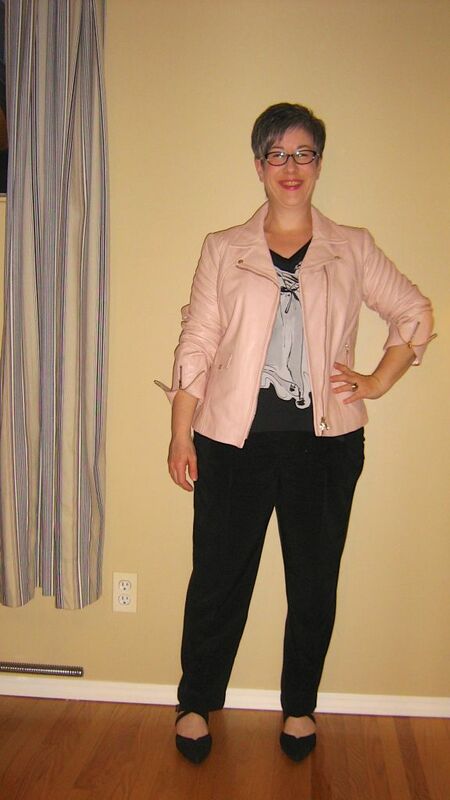 My blush leather moto jacket arrived yesterday…and it was black! They had sent the wrong jacket. I phoned my local store and luckily the blush jacket had finally arrived in store so I was able to go and exchange it for the correct colour. The SA had me try on the size I had ordered and when I did, she asked if I would be willing to try on one size up. She felt this particular jacket looked fabulous a little looser. I did and she was right. This size also zips up quite comfortably and I've decided I prefer that. The jacket is a little heavier than I had thought and so will work great as an outdoor jacket as well, in which case I'm glad I can do it up. 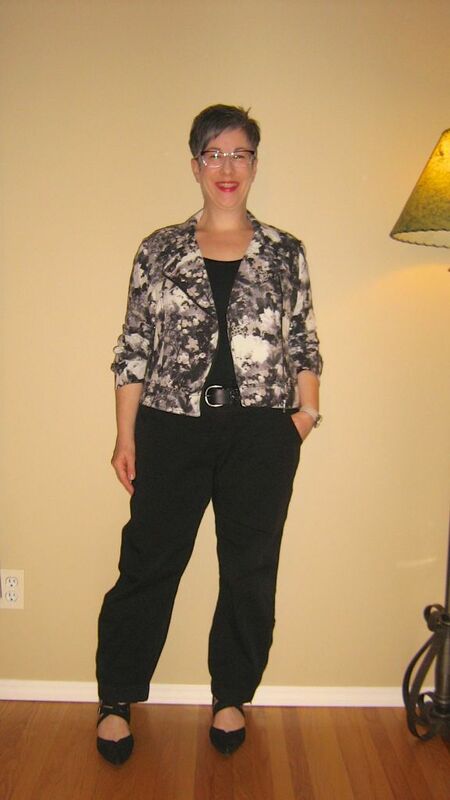 I've the paired the jacket with a simple ensemble of my black slouchy trousers and my black/white silky graphic tee. 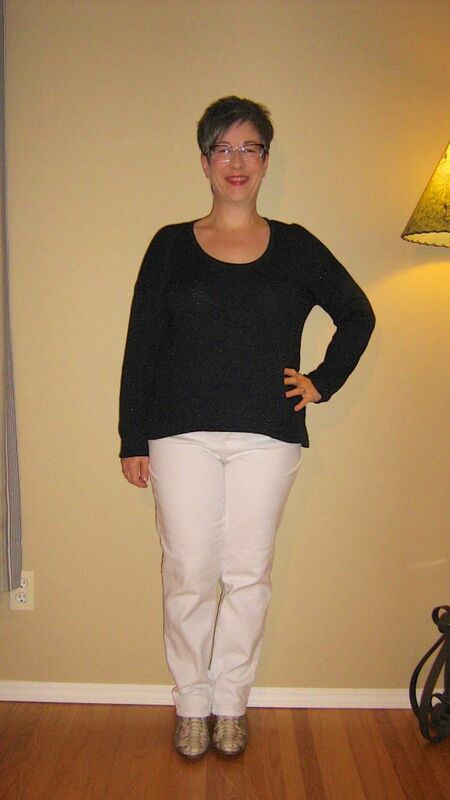 I chose my large cream handbag to pull out the white ballerina on the tee and am debuting my new black sandal shoes. This is the same brand as my bone/silver sandal shoes I bought last year and have determined are the best footwear choices I have ever made. You'll be seeing a lot of these. Pink lipstick and black/white specs finish off the outfit. P.S. The sleeves on the leather jacket need shortening but I don't want to lose three weeks of wearing weather so am just folding over and scrunching for now. Once it's too hot to wear the jacket, I'll send it in to have the sleeves shortened. So what do you think? Does this work? As always, all comments/suggestions welcome. P.P.S. I hate the way my wall colour makes the blush look! 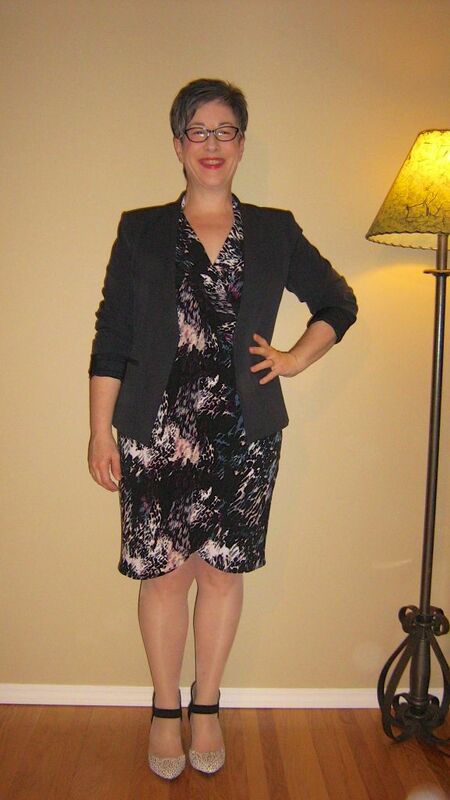 I've worn this abstract print dress before with my navy Lanai blazer, but wore my black kitten heel pumps and carried a black handbag. To lighten up the combination today to make it a bit more springy, I chose my black and white ankle strap pointy toe pumps and my large cream handbag. I'm happy with the combination. I think it would look even better with my white leather clutch since I think the large cream satchel is a bit out of scale somehow with this outfit. But too late now to change it. What do you think? Do the touches of white help to lighten up the overall outfit? As always, all comments/suggestions welcome. So what do you think? I must say, I feel quite "snappy" in this ensemble and can't believe I have never paired ink and white together before. Thank you Angie and Sveta :) As always, all comments/suggestions welcome. 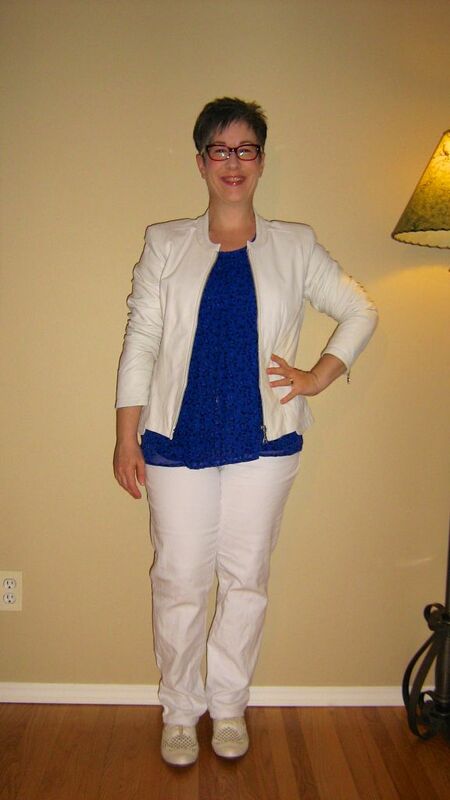 I've always enjoyed watching MaryK put together fab outfits based on Pinterest ensembles. I've been pinning outfits for a while now and decided to try and copy some of the outfits I really like. 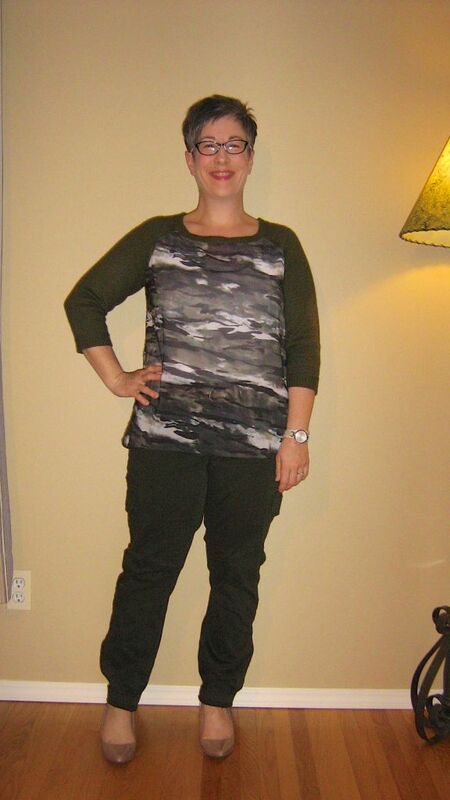 Today's ensemble started with my olive green cargo pants to which I added my draped front white tee. The Pinterest version has a drapey blush tee but I don't have that colour, although I would love to find one. On top of that, I've added my black suit blazer with scrunched sleeves. My pointy toe patent booties are the footwear of choice. Then to add a bit of blush to the outfit, I went with my blush with gold hardware leather clutch. My rose gold/black watch, black/white specs and gold ring finish off the outfit. So what do you think? Decent copy? I must admit - it's not only fun but kind of makes putting together the outfit easy because you've already been given the idea. As always, all comments/suggestions welcome. P.S. Gain felt he could add something to the accessories department.